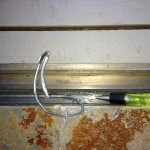 Is you sliding patio door hard to operate? Does it seem to want to skip and bump along the track? This can either be caused by worn out rollers or a bad track. 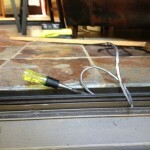 Patio door rollers are easily replaced and Wenatchee Valley Glass stocks the most common types. If we don’t have your particular roller in stock we can order it from one of our many hardware suppliers to get your door functioning like new. When the sliding glass door rollers go bad one thing that gets worn out at the same time is the track the roller ride on. This track can sometimes be replaced as shown below. This is not easy on the chisel and they usually wear out quickly. The new track has been glued down to prevent squeaks and mechanically fastened with pop rivets. Other times we can install a horseshoe shaped track cover. This covers the track and provides a smooth surface for the new rollers to ride on. 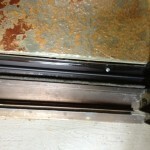 Keep in mind at times all we can do is replace the rollers or if the integrity of the door is too bad replace the door. We will offer a fair assessment of your door and present you with your options to repair you existing door or replace the door with a new Ply Gem vinyl sliding patio door.